Candis Callison. How Climate Change Comes to Matter: The Communal Life of Facts. Duke University Press, 2014. 316 pp. Bookshelves (well, at least virtual bookshelves) burst, like breached reservoirs, with new literature on climate change. Only a few years ago, our climate scholarship suffered from a long drought, fed only by a limited stream coming out of the natural sciences and political sciences. But that is no longer the case. Climate scholarship has picked up strong feeder streams from the humanities, the arts, and the other social sciences, and this development has both filled shelves and freed the conversation from its predictable course. What has motivated this shift is that the big empirical questions – Is climate change happening? And will it affect our children’s lives? – are all-but settled. It is happening and it will affect our children’s lives. Climate scholarship has consequently moved beyond these (and other) important empirical questions to new social questions that take us into the realm of ethics, epistemology, ontology, and cultural politics. Today, we want to know, for instance: what a post-carbon economy might look like in terms of praxis and imagination; what the moral debt of rich carbon emitters is to the energy-poor Global South and equatorial regions where climate change puts people at severe risk; and the extent to which the political structures of late capitalism, and perhaps even democratic politics, rest on a carbon infrastructure that has become ecologically unstable. Social theorists and humanistic scholars are well equipped for this terrain. 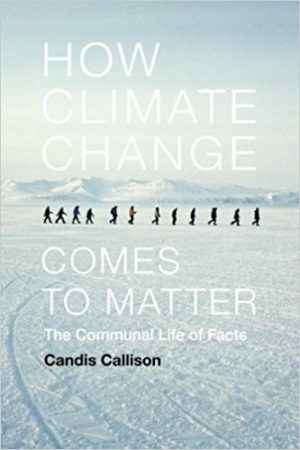 Candis Callison’s How Climate Change Comes to Matter: The Communal Life of Facts adds another important question to this literature: how does knowledge about climate change enter into the vernaculars of different groups so that people can act with shared meaning and conviction? Climate change, she says, is not an inert thing. It is “a form of life” that can only have significance for us if it comports with the ethics and values that otherwise drive us to action (1). Put a bit differently, Callison wants to know how climate change comes to have a home in our social life so that we can make meaning of it and potentially do something about it. On this question, Callison’s book is a thoughtful and capable intervention. It offers a compelling analysis of the epistemic frames that give life to climate change in five different communities of activism (or near-advocacy, as the case may be). The communities she chooses include those of Inuit climate activists, Western climate journalists, Creation Care evangelicals, Western climate scientists, and businesses affiliated with the climate NGO Ceres. Callison’s project is anchored in the premise that we can no longer fall back on a flawed modernist belief (which still expresses itself in some scientific circles as a bullish positivism) that distributing accurate knowledge about climate change will make the course of political action clear to us. Information, she tells us, is not the problem, nor is its distribution (20). We have these in spades. The problem is how that information, or the facts of climate science, get slotted into our different cultures of knowledge, how those different cultures produce their own facts about climate change, and how this localizing of knowledge about climate change is critical to helping people to make meaning of it and gird them to action. There can be, in other words, no straight-line in climate activism between facts and truth, or between information and action. There are only the crooked lines of the structuralist and post-structuralist – lines that detour through context and values. In the world of action, the lingua franca of science is simply too empty to summon to life widespread moral or ethical commitment. How we articulate and translate climate change into the life of our tribes is what Callison refers to in her subtitle as the communal life of facts. How Climate Change Comes to Matter is a monograph based on semi-structured interviews that the author did with each of these five different groups (and the institutions that represent them) between approximately 2007 and 2008. Its method is in part journalism, in part ethnography, and in part discourse analysis. For each case study, the author spent some time immersed in the communities she studied, interviewed their members, and examined key texts written by activists in those communities. Her first chapter, for instance, centres on interviews conducted with participants of the Inuit Circumpolar Council, a transnational group of Inuit activists who address Indigenous issues related to the impact of climate change on the Arctic. The second chapter centres on western journalists, including a few key journalists working on climate science at the New York Times, who translate climate science for the broader reading public. The third chapter turns to the fringe movement of evangelical Christians working on Creation Care who have integrated climate concerns into scripture and religious practice. The fourth chapter examines Western scientists who have stepped out of the laboratory to serve as advisors on climate change with varying degrees of ontological anxiety over their role in advocacy. And the fifth chapter centres on corporate signatories to the CERES principles, a set of climate commitments adopted by various companies around the globe under the non-profit organization by that name. Callison acknowledges that what constitutes a group or discursive community here is somewhat loose, but her rationale for selection is reasonably conceived, and the samples she has chosen are representative enough to be compelling. Each chapter of How Climate Change Comes to Matter offers a lucid analysis of how the subject of climate change poses certain dilemmas and opportunities for different communities. For instance, the first chapter on Inuit climate activists associated with the ICC explains that for these political actors the terminology, the science, and the politics of climate change have proven too abstract and detached from local concerns to gain much ground in the community’s political imaginary. Instead, precedence continues to be given to what Callison calls “grounding knowledge,” or Traditional Knowledge based on native observation and local experience and memory (52-57). The abstract modelling touted by climate scientists on the global scale thus finds less traction in this community, because it is, she explains, associated with actors who only pop in and out of Inuit communities and who tend to be only marginally invested in Inuit practices and life-ways. Callison argues that many Inuit activists, in fact, resist, or even “reject,” the discourse of climate change because it ignores the actual problems that they face on the ground, including the dramatic reduction in tundra lichen, changes to moose and reindeer migrations, and the accumulation of toxic pollutants in the bodies of the seals, whales, and walruses that Inuit rely on for food. One effort to give meaning to climate change in this community was made in 2005 when Inuit activists submitted a petition to the Inter-American Commission on Human Rights to redefine climate change as a human rights cause that would hold carbon emitters legally culpable for the lost life opportunities of Inuit peoples in the North (64-68). Without that social justice framework, Callison says, the terminology of climate change and its politics remain less compelling to Inuit activists than do the shared tribal frameworks that govern their local responses to and mitigation of the world’s industrial impact on Arctic peoples. An equally interesting chapter focuses on the surge of climate activism among a portion of the evangelical community in the United States. For this community, like the Inuit, the dominant epistemic frames in climate change that circulate at the national and international levels do not speak to the group’s values and priorities. Callison explains that because climate science reproduces a secular knowledge that is associated with evolutionism and the rejection of providence, its discursive assumptions sit uncomfortably with many in the evangelical community for whom belief in divine creation is deeply rooted (126). Environmental activists in this community (who have rallied around the 2006 Evangelical Climate Initiative and the concept of Creation Care) have instead worked to reframe the issue so that that it fits within a clearer scriptural and providential framework and so that it is not synonymous with anti-creationist scientists, Liberals, Democrats, and various left-leaning environmentalists. To accomplish that reorientation has meant emphasizing the biblical injunction that humans are stewards of God’s creation and that they are charged with caring for the unfortunate and the dispossessed (126). What is important to Callison here is that the facts of climate change come to matter in this evangelical community only after they have been “blessed” by the proper church authorities and trusted conservative insiders. The life of facts in this instance do not circulate through the generalized universe of scientific knowledge: they require validation by the right people (137, 147). The remaining chapters of How Climate Change Comes to Matter focus on three other major epistemes that govern the practices of key environmental actors today: that of climate journalists whose prevailing professional norms and ethics have been put to the test by the politicization of climate science, that of climate scientists whose research has cast them into the public sphere where apolitical knowledge comes to imply ethical responsibility, and that of socially-conscious corporate actors who are working to frame climate responsibility within existing market presuppositions and structures. Of these chapters, Callison’s work on the NGO Ceres is especially thought provoking. It takes us into the work that this non-profit has done to reframe climate change within the episteme of “risk assessment,” which aligns closely to the social, political, and ethical life of contemporary capital. In this chapter, the communal life of facts on climate science collides with corporate prognostications about opportunities for sustainable practices and the perception of increasing environmental and financial risk from conducting business as usual. Callison’s case study of Ceres draws out for us the political parameters of, the constraints and opportunities, of tackling climate change from within the dominant discourses of profit, growth, and managed risk that govern the life of capital in the global marketplace. There are, of course, limitations to this book, as there are to any monograph. The first is that the book’s theoretical framing is laid out in a plodding introduction that runs for 38 pages, making it less readable and lucid than it could be. The author’s main theoretical insight, concerning the vernaculars of climate change, is fairly straightforward, and its replaying in this chapter makes the reading more methodical, and dissertation-like, than necessary. The second limitation is one that Callison has already anticipated: the book freezes a particular historical moment in climate politics. Most of the references trace back to 2006 and 2007, to a decade ago when the author originally conducted her interviews and visited conferences held within these communities (10). Because the field of climate activism is swiftly changing, the data analyzed (but not the argument itself) feels as much like historical documentation as it does current politics. And a third, minor, limitation to this book is that the detail of its individual chapters will likely be of most interest to scholars working on the specific groups that she analyzes. Fewer readers, with the exception of social scientists interested in the praxis of knowledge production, will need to work through the biographies of individuals and institutions or the textual examples of each chapter to get to its main contribution. But these types of qualifications do little to detract from the contributions that Callison’s study makes. Overall, How Climate Change Comes to Matter delivers a powerful message with regard to climate activism, and it is a message that we should all take home. If climate change is to become a meaningful form of life, it will have to put the universalist language of the natural sciences in its place and enter into our lives through the particular cultural practices and values that motivate us to wake up each morning and to think in shared ways about the future. The facts can, that is, no longer be taken for granted. Our job is now to understand “how, why, and when” those facts come to matter in a cosmopolitan world that resists being homogenized (5). Bob Johnson is an environmental historian and cultural critic with publications ranging across energy, ecology, poetry, film, journalism, and race relations. He is an Associate Professor of History at National University in La Jolla, California and the recent author of Carbon Nation: Fossil Fuels and the Making of American Culture (University Press of Kansas, 2014).